The immediate greetings out of the way tea was made - brewed not rolled - and Davey took out his guitar and started playing. After a few numbers I remembered I had a tape recorder of sorts and turned it on. One or two mildly inebriated students had followed Davey Graham into my room. A few more drifted in as the sound of Graham's guitar penetrated the room. The tape recorder of sorts was in fact a domestic mono Philips reel-to-reel machine. Fortunately the tape spool remained in John Pilgrim's possession and the recording was commercially released on CD as Davey Graham ‎– After Hours (At Hull University, 4th February 1967) in 1997 by Rollercoaster Records and remains available. 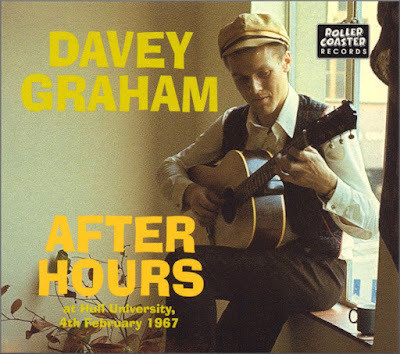 The After Hours album has achieved legendary status because after cleaning up the master tape produced surprisingly passable sound and captured Davey Graham's brilliant guitar technique without the artifice of a recording studio. The track list, which includes takes on Bach's Bourée in E minor, Art Blakey's Buhaina Chant, the gavotte from Robert de Visée's D minor suite, and a medley of She Moved Thru' the Bizarre and Blue Raga, reflects his eclectic tastes. Here is a CD for people who like music without pre-definitions and without pre-packaging. The recording and its survival involved a whole series of accidents. Enjoy the results. No comps used in this post. Any copyrighted material is included as "fair use" for critical analysis only, and will be removed at the request of copyright owner(s). Also on Facebook and Twitter.